Adjacent to the Big Wood River on 85 acres, the Osprey Estate is comprised of the Osprey Main House and Osprey Guest House. This listing is for the 3,600 SF Osprey Luxury 4BR / 4.5 Bath Guest House. 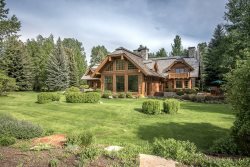 Completely updated and re-furnished in 2016, the Osprey Guest House is nestled among Aspen trees 40 yds from the Osprey Main House and only 50 yds to the Big Wood River. The Guest House includes (3) Bedroom Suites plus a full Mother-In-Law Suite/Apartment (including Kitchen) which may be locked off from the rest of the home. LIVING AREA: Large and inviting with cathedral ceilings the Living Area feature a leather sofa and (3) chairs in front of a Wood Burning Fireplace and Flat Screen Smart TV. Adjacent to the Living Area, a sunny SITTING/DESK AREA with Desk, (2) Leather Chairs and built in bench is a great spot to curl up with a book or enjoy your coffee while enjoying the views. Lastly, there is a Powder Room for guests' convenience off the Living Area. DINING AREA: Adjacent to the Living Area, the Dining Area enjoys Mountain and River Valley views. UPDATED KITCHEN: Adjacent to both the Living and Dining Areas, the Kitchen is fully equipped and features new (2016) Stainless Steel appliances, counter seating for four and a breakfast nook (seats 4). The Balcony with Gas Grill may be accessed from the Kitchen. MOTHER-IN-LAW SUITE/APARTMENT: Perfect for grandparents, nannies, or anyone that prefers their own space, the Mother-in-Law Suite is complete with its own Living and Dining Areas, Smart TV, Kitchen, Bedroom, and Exterior Entrance. The interior access to the rest of the home may be locked off for privacy. BR 2- Lower Floor King Suite with King Bed, Built In Twin Bed, and En Suite Bath with Glass Enclosed Shower Tub Combo. BR 3 - Lower Floor Twin Suite with (2) Twin Beds, (1) Built-In Twin Bed, Desk Area and En Suite Bath with Glass Enclosed Shower Tub Combo. BR 4- Mother-In-Law Suite with Queen Bed and En Suite Bath with Glass Enclosed Shower Tub Combo. With a distinct and separate driveway and 1-car heated garage; this home is a private getaway in its own right- or may be rented with the Osprey 4 BR Main House for larger groups. During the Holiday Season, the Osprey Main Home and Guest Home must be rented together.